Congratulations go to Tim (Friedgold) for winning Car of the Month January 2007. His superb example of a P11 GX, shows us once again that you don't need a GT to steal the spotlight in here! Well done Tim, how does it feel to win CotM? The very first of 2007! It's such an honour. There are so many nice cars in the club I was stunned to be awarded it! Obviously I love the way it looks but it's often difficult to appreciate your own work so to know other people like it too is really rewarding. Before we discuss the car, can you tell us a bit about yourself? My Name is My name is Tim Lake and I live in Bedford. I graduated from Aston Uni about 18 months ago and have been working in IT support in London for nearly a year. I am a bit of a gadget freak/geek, I am into cars, of course, and also love music. I used to DJ at uni and still do a bit but I'm not doing gigs or anything at the moment. Can you tell us how you came to buy this car, were you specifically looking for a Primera? Also, how did you come to find NPOC? It's a strange story really. My Mum used to work in Luton and couldn't park her Shogun there so needed a smaller car. She also needed an auto. We went to a few garages and found the Primera sitting on 50k miles and looking perfect. She secretly enjoys a bit of power so the 2litre engine swung it and we traded my old Renault 5 in. After a year she stopped working in Luton and the car became more and more 'mine' until a year ago they offically signed the log book over to me! We love the JDM style, did you have a vision for the car or have you modded as you went along? Initially I was planning to save up for the CarConcepts kit but money was not abundant. Then one fine day, Kev (PrimeraRacer) put up a for sale thread selling the bodykit from his ex import project. I jumped on it, and once the kit was on I just loved the JDM-ness (?) it exuded. I decided the leave the non-GT grills on because of that and follow the JDM style with future mods. Have you intended to show the GX as a model which is up there with the best or just do your own thing? Not really, I never thought I'd get into modding it but it's such a lovely car it seemed to deserve it. The GX seems to be a model that has whatever bits were left in the factory and I got lucky with chrome handles, leather steering wheel, door sill plates etc. Not sure about the interior though! Is this your first journey into car modification, any other motors? I had made a few changes (colour coding, alloys, light masks etc) on the Renault 5 but this is the first car I've really changed in any substantial way. Perfect time to hear your full spec list. Can you also tell us which modification you would select as your favourite and which modification you found the most difficult to do? My favourite (and the most difficult) has to be the CarPC and audio. It was a total project from research, to purchasing, fitting, fixing etc. It's a pretty unique mod and it combines my loves for technology and cars. I learned a lot about the wiring in my car and there were quite a few problems to overcome which makes the final result so much more rewarding. I love the bodykit too though. 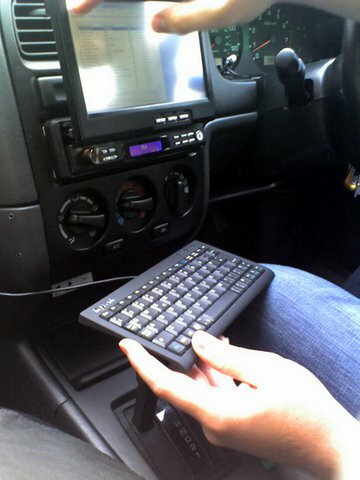 Full CarPC complete with sat-nav, music, DVD, WiFi, Datascan etc. Anything planned for the car that you can let us in on?! I'm on a big saving mission for a few months now, kick the rest of my student debts and get myself a PS3! Having said that, the next things I am looking at are performance. I'd like to get some lowering springs, header, cold air intake and maybe the JWT cams. Given an endless money supply, what would you most like to do with the car? Definitely a supercharger. I'd also retrim the interior and go for a full respray in midnight purple with metal flake. Coming up two years of club life now Tim, how have things in the Primera world changed over the time in your eyes? It's a shame but there are less Prims about now, obviously because there is no new model to keep the name going. Having said that, there are a lot of very good models around for silly money because, as we say time and time again, only Primera owners know how good they are. There also seem to be a few custom parts coming around now and more people willing to take the initiative and do something different. Can we hope to see you again around the shows and events in 2007? Definately. Until this year I hadn't been to any but I'm getting addicted now and I've made some good friends through the club. It?s always such a good laugh and not the chavvy burnout affair you picture car meets to be. I also have to say a big shout to Demon Bodystyling near Bedford - They painted, polished, and fitted the bodykit, and tinted the lights and it looks amazing. They also warranty the work for life! MP3Car.com forums were an invaluable resource for the PC. Finally I want to say a big shout to NikC, a fellow Bedfordshire member and good mate and especially to my awesome girlfriend Jane who not only puts up with me spending time and money on the car but also takes a real interest in it all and comes along to meets etc.